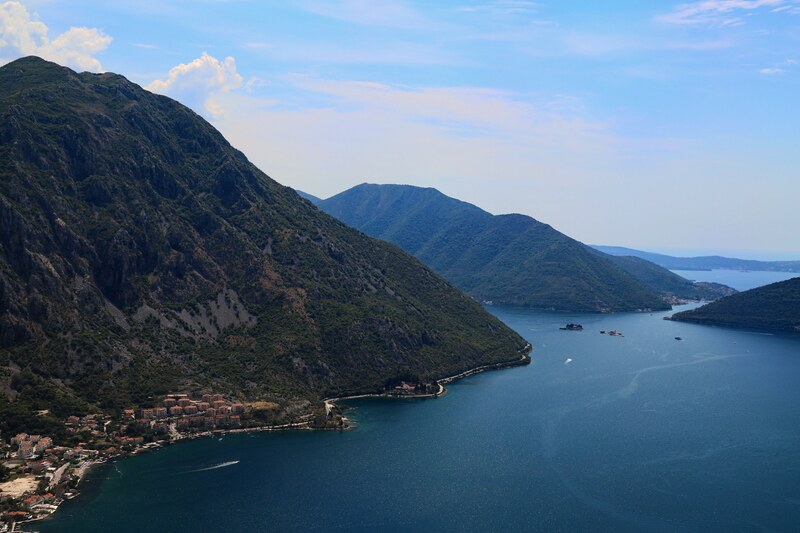 At the suggestion of Goran, I pull my roots from Kotor and motor north, rounding the bay and leaving the stop and go traffic behind. 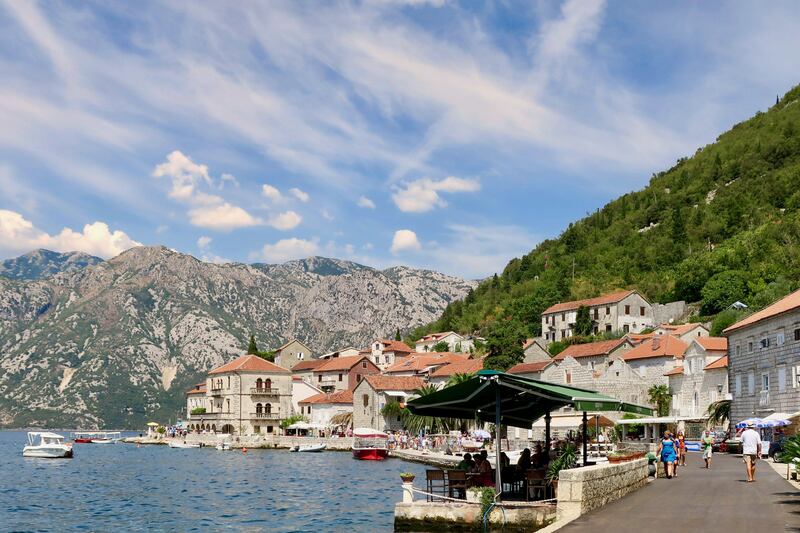 I pull off the road, and a parking guard lifts the gate that keeps most vehicular traffic out of the tiny bayside fisherman village of Perast. There is one street, it’s a stony concrete path barely wide enough for a car and motorcycle to pass. The bay kisses the path where people in bathing suits stroll. Many cafés sit on the water, and guest houses line the other side. The cozy and recently renovated digs, the Admiral Apartments, sit on the top floor or a 19th century stone building. My host is quick to show me the view from the roof, where I find a small table and chairs surrounded by loosely spaced bare rods of protruding rebar. I see these often in developing countries. Some call them prayer rods, where people pray they can expand their homes. They’re planning more rooms. 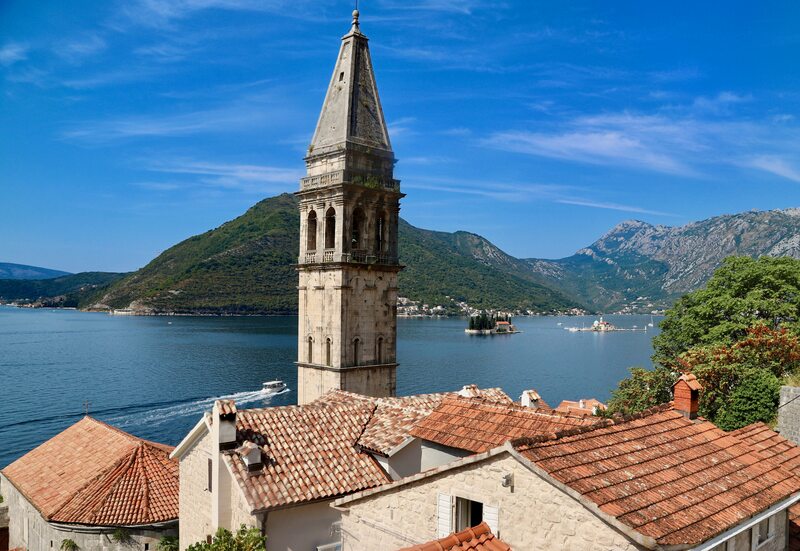 There’s not much to do in Perast. And that’s the point. It’s quiet, there are just a handful of restaurants. Most people lounge on the rocks, swim or take boat tours to see the tiny islet Our Lady of the Rocks which was handmade of loose stones. As they tell the story, in 1452 seafaring sailors spotted the icon of Madonna and Child on a rock at sea. So they made an oath that after returning from each voyage the tossed a rock into the water. Over the years, the islet sprouted from the sea. 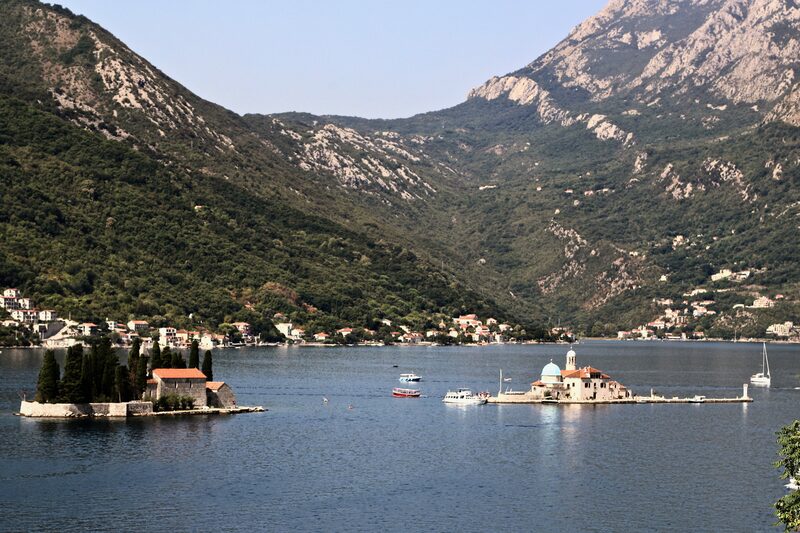 On the left is St. George, a natural Island with a Benedictine monastery. On the right is Lady of the Rock which over 200 years locals created this island by tossing rocks into the water. The timing doesn’t work for me to go out the island. I’m disappointed now I didn’t take the time, but I wondered about the elderly women walking up and down the path along Perast with lovely lace and embroidery fabric and clothes draped over their arms. Another legend of the island is of a local woman, Jacinta Kunić-Mijović, who took 25 years to embroider a tapestry using strands of her hair among the gold and silver threads. She did this while waiting for her sweetheart to return from a long journey at sea. She went blind making it as he never returned. The tapestry is featured among other artwork in the church. Today, local women carry on the tradition of handmade embroidery with religious motifs and sell them along the seaside. I enjoy fresh seafood at Conte Restaurant while waiting for my seaside table I enjoy a glass of local sparkling wine. 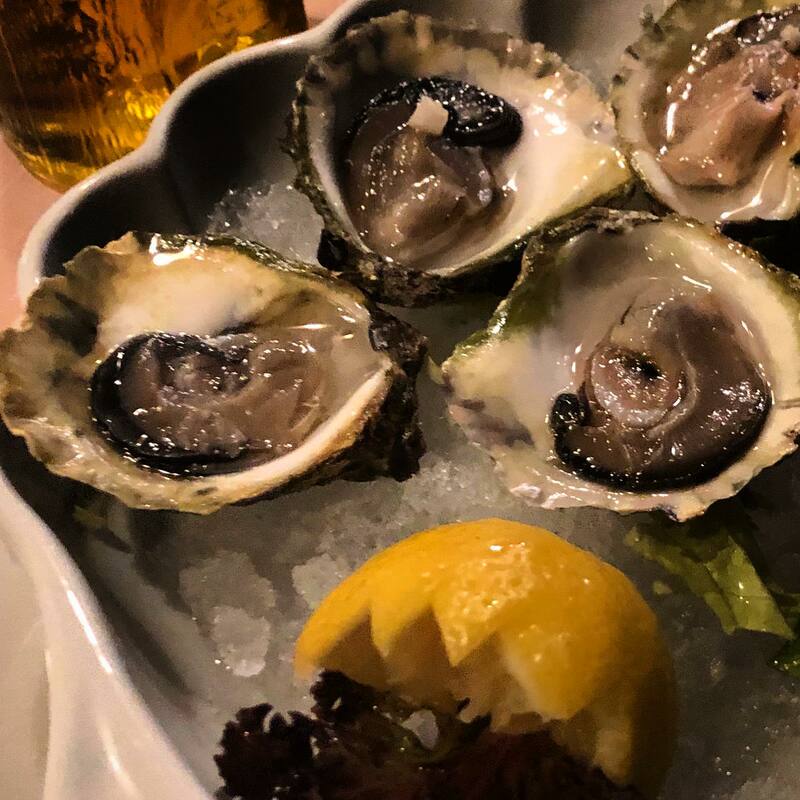 Raw oysters followed by grilled octopus all paired with a nice bottle of Vrnac, the local grape that defines the best and future of Montenegro’s wine identity. After dinner, I meet the owner’s son, who now manages the excellent restaurant and beautiful boutique hotel. He tells me that in high school (2001) he lived in Lake Elsinore, California as an exchange student, and confides that the cultural shock of being away at a young age made him bitter and reserved while in California. In retrospect, he wishes he took more advantage of the experience, though still says it was one of the best of his life. 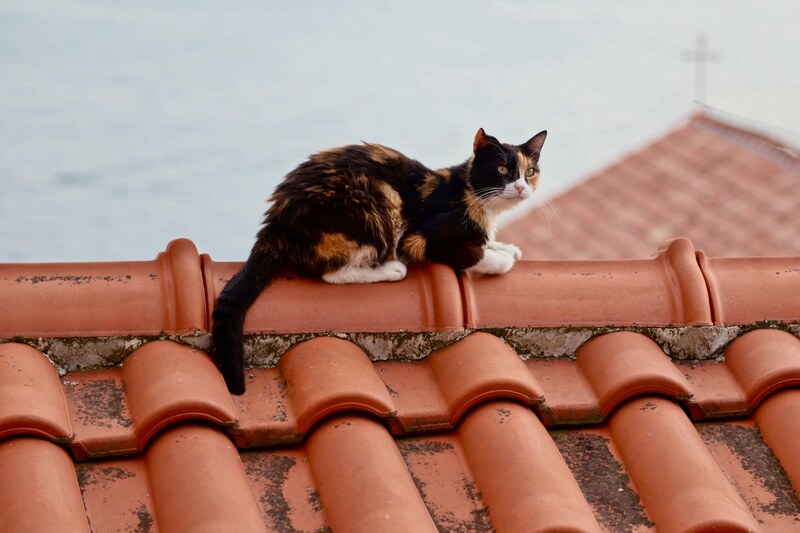 Cat on a hot roof in Perast. She gets great views! 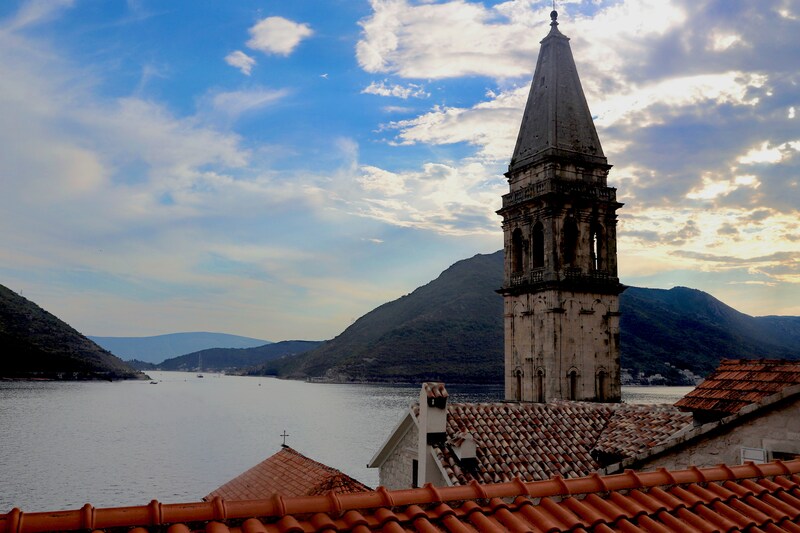 My apartment gives me the best view of Perast! He tells me that the nationalism rampant in the Balkan states and especially in his own country is destroying culture and happiness in the local people. As one large Yugoslavia, he tells me, the former republic had more strength and commanded more respect on the national stage. Today, little Montenegro has no power in its own economy. He feels the split of the country into small states creates a false sense of nationalism and pride. I see I’ve struck a sour chord in my host as he continues to express his doubts for the future of these states. His family is thriving and their business— the hotel and restaurant—are the priciest and highest rated in this small town. Yet it does not fulfill him, hinting at there’s more to happiness and success. He tells me that Montenegro makes good wine, but Croatian wine is much better. His mom is Croatian, and dad is from Montenegro. He insists he’ll show me, and pours me a glass of 2006 White Riesling, explaining it was rated as the best wine in the world. I imagine a time that the wine he poured was not Croatian; instead it could or would be Yugoslavian. Beautiful pictures, I’ve always longed to travel overseas. Thank you for allowing me to travel vicariously through you at least :P.
Thanks Brittny, so glad to have you along for the ride! It’s going to get better! Truly a fun trip in a fantastic place! I envy you the trip for sure. the rest of your journey! !